Tulku Ajam Rinpoche is primarily stationed in Taiwan. Click here for his biography in Mandarin. 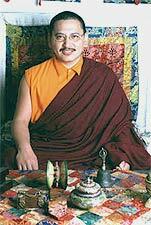 Tulku Ajam Rinpoche is the incarnation of His Holiness Penor Rinpoche's younger brother. He lived in Switzerland until he was recognized at the age of 15 when he subsequently was brought to Namdroling Monastery where he completed his studies. Our "high-tech" Tulku Rinpoche has been responsible for designing and maintaining the computerized registration and enrollment systems at the monastery. He oversees the administration of the annual journey undertaken by Namdroling monks to Bodh Gaya for Monlam Chenmo. In Taiwan he carries through teaching programs as well as overseeing website operations there. In addition to his native Swiss German, he is fluent in Tibetan, Mandarin Chinese, Hindi, and English. © Copyright 1995-2008 by Palyul Ling. All rights reserved. Please do not reproduce without prior written permission.